Diffusion bonding is a solid-state process by which similar or dissimilar materials are joined together at the molecular level using heat and pressure to create a permanent bond without using adhesives. This technique has been used on metals for centuries, and has rapidly grown in use with high-performance plastics over the last couple of decades. Piedmont CMG has contributed to this rapid growth by mastering our own proprietary diffusion bonding process, which provides a number of benefits to OEMs around the world. 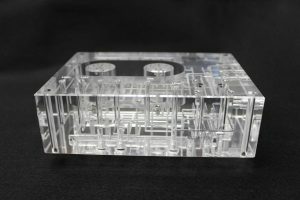 Of the many advantages exhibited by a plastic diffusion bonded manifold, one of the most important has to be the ease of design flexibility. By utilizing multiple layers of material combined with precision machining, CMG is capable of producing manifolds filled with intricate channels that control the flow of fluids through a device in almost any configuration required. These channels are milled directly into the bonded surface and retain their shape throughout the bonding process, so there is no need for inserting tubes or pipes to hold the desired channel shape. This equates to a reduction in parts, materials, weight, and cost. Perhaps even more important for many modern applications is that the bonded channels will have no contamination from glues or solvents. Zero contamination is the perfect condition for applications such as medical, diagnostic, pharmaceutical, laboratory research, and clinical chemistry projects. In addition, almost all of the machining is done before the bonding process, so there is no risk of burrs or other defects being found within the channels. Another key advantage of using diffusion bonding is simply the strength of the bond itself. By exposing a material to heat and pressure over time, a bond can be created at the molecular level. The resulting permanent bond is uniform and difficult to detect with the naked eye. A diffusion bonded part will exhibit essentially the same thermal and chemical resistance properties as the base polymer. This allows for tough manifolds that can withstand repeated exposure to various temperature ranges and chemicals without the need for coating or reinforcement. These functional advantages, plus the added aesthetic appeal of a uniform, transparent manifold, are why many OEMs are choosing diffusion bonding over other methods, such as solvent bonding. The primary polymers that are requested of CMG to be used in diffusion bonding applications are acrylic (PMMA), and Ultem® (PEI). Both materials have their own strengths and weaknesses, but a quick summary of them is as follows: PMMA is the most commonly used material because it has the highest clarity and the lowest price tag, plus some limited chemical resistance. Ultem® has less clarity due to its amber color. However, it also has a very high tensile strength, paired with excellent thermal and chemical resistance properties. It is truly the ULTimate Engineered Material. Creating a multi-layered diffusion bonded manifold is both an art and a science. The diffusion bonding process itself has been around for a long time, but it has been perfected here at CMG. Our precision, quality, and repeatability have led to our rapid growth, and contributed to diffusion bonded manifolds being used around the world in a variety of industries.